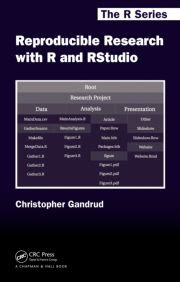 This is an abridged excerpt from Chapter 2 of my new book Reproducible Research with R and RStudio. It's published by Chapman & Hall/CRC Press. You can purchase it on Amazon. "Search inside this book" includes a complete table of contents. Researchers often start thinking about making their work reproducible near the end of the research process when they write up their results or maybe even later when a journal requires their data and code be made available for publication. Or maybe even later when another researcher asks if they can use the data from a published article to reproduce the findings. By then there may be numerous versions of the data set and records of the analyses stored across multiple folders on the researcher’s computers. It can be difficult and time consuming to sift through these files to create an accurate account of how the results were reached. Waiting until near the end of the research process to start thinking about reproducibility can lead to incomplete documentation that does not give an accurate account of how findings were made. Focusing on reproducibility from the beginning of the process and continuing to follow a few simple guidelines throughout your research can help you avoid these problems. Remember "reproducibility is not an afterthought–it is something that must be built into the project from the beginning" (Donoho, 2010, 386). This chapter first gives you a brief overview of the reproducible research process: a workflow for reproducible research. Then it covers some of the key guidelines that can help make your research more reproducible. Instead of starting to use the individual tools of reproducible research as soon as you learn them I recommend briefly stepping back and considering how the stages of reproducible research tie together overall. This will make your workflow more coherent from the beginning and save you a lot of backtracking later on. The figure below illustrates the workflow. Notice that most of the arrows connecting the workflow’s parts point in both directions, indicating that you should always be thinking how to make it easier to go backwards through your research, i.e. reproduce it, as well as forwards. Around the edges of the figure are some of the commands that make it easier to go forwards and backwards through the process. These commands tie your research together. For example, you can use API-based R packages to gather data from the internet. You can use R’s merge command to combine data gathered from different sources into one data set. The getURL from R’s RCurl package and the read.table commands can be used to bring this data set into your statistical analyses. The knitr package then ties your analyses into your presentation documents. This includes the code you used, the figures you created, and, with the help of tools such as the xtable package, tables of results. You can even tie multiple presentation documents together. For example, you can access the same figure for use in a LaTeX article and a Markdown created website with the includegraphics and ! () commands, respectively. This helps you maintain a consistent presentation of results across multiple document types. Have a plan to organize, store, and make your files available. Using these tips will help make your computational research really reproducible. In order to reproduce your research others must be able to know what you did. You have to tell them what you did by documenting as much of your research process as possible. Ideally, you should tell your readers how you gathered your data, analyzed it, and presented the results. Documenting everything is the key to reproducible research and lies behind all of the other tips here. Your documentation is stored in files that include data, analysis code, the write up of results, and explanations of these files (e.g. data set codebooks, session info files, and so on). Ideally, you should use the simplest file format possible to store this information. Usually the simplest file format is the humble, but versatile, text file. Text files are extremely nimble. They can hold your data in, for example, comma-separated values (.csv) format. They can contain your analysis code in .R files. And they can be the basis for your presentations as markup documents like .tex or .md, for LaTeX and Markdown files, respectively. All of these files can be opened by any program that can read text files. One reason reproducible research is best stored in text files is that this helps future proof your research. Other file formats, like those used by Microsoft Word (.docx) or Excel (.xlsx), change regularly and may not be compatible with future versions of these programs. Text files, on the other hand, can be opened by a very wide range of currently existing programs and, more likely than not, future ones as well. Even if future researchers do not have R or a LaTeX distribution, they will still be able to open your text files and, aided by frequent comments (see below), be able to understand how we conducted your research (Bowers, 2011, 3). Text files are also very easy to search and manipulate with a wide range of programs–such as R and RStudio–that can find and replace text characters as well as merge and separate files. Finally, text files are easy to version and changes can be tracked using programs such as Git. Treat all of your research files as if someone who has not worked on the project will, in the future, try to understand them. Computer code is a way of communicating with the computer. It is 'machine readable' in that the computer is able to use it to understand what you want to do. However, there is a very good chance that other people (or you six months in the future) will not understand what you were telling the computer. So, you need to make all of your files 'human readable'. To make them human readable, you should comment on your code with the goal of communicating its design and purpose (Wilson et al., 2012). With this in mind it is a good idea to comment frequently (Bowers, 2011, 3) and format your code using a style guide (Nagler, 1995). For especially important pieces of code you should use literate programming–where the source code and the presentation text describing its design and purpose appear in the same document (Knuth, 1992). Doing this will make it very clear to others how you accomplished a piece of research. If everything is just a text file then research projects can be thought of as individual text files that have a relationship with one another. They are tied together. 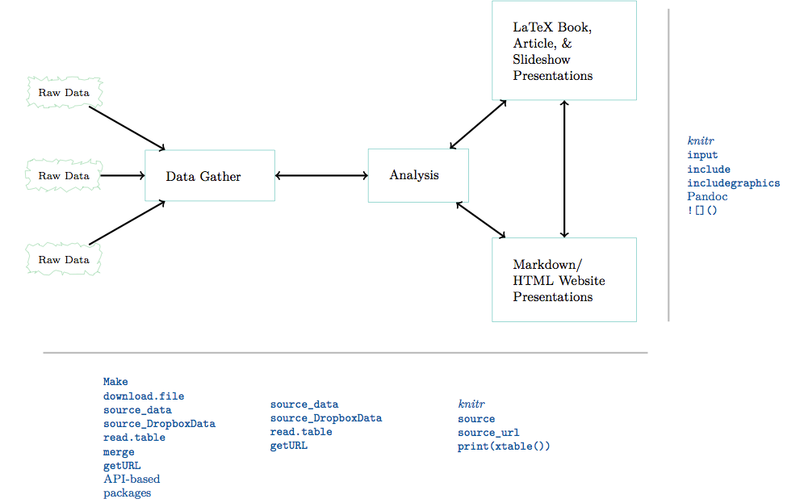 A data file is used as input for an analysis file. The results of an analysis are shown and discussed in a markup file that is used to create a PDF document. Researchers often do not explicitly document the relationships between files that they used in their research. For example, the results of an analysis–a table or figure–may be copied and pasted into a presentation document. It can be very difficult for future researchers to trace the table or figure back to a particular statistical model and a particular data set without clear documentation. Therefore, it is important to make the links between your files explicit. Tie commands are the most dynamic way to explicitly link your files together (see the figure above for examples). These commands instruct the computer program you are using to use information from another file. Finally, in order for independent researchers to reproduce your work they need to be able access the files that instruct them how to do this. Files also need to be organized so that independent researchers can figure out how they fit together. So, from the beginning of your research process you should have a plan for organizing your files and a way to make them accessible. One rule of thumb for organizing your research in files is to limit the amount of content any one file has. Files that contain many different operations can be very difficult to navigate, even if they have detailed comments. For example, it would be very difficult to find any particular operation in a file that contained the code used to gather the data, run all of the statistical models, and create the results figures and tables. If you have a hard time finding things in a file you created, think of the difficulties independent researchers will have! Because we have so many ways to link files together there is really no need to lump many different operations into one file. So, we can make our files modular. One source code file should be used to complete one or just a few tasks. Breaking your operations into discrete parts will also make it easier for you and others to find errors (Nagler, 1995, 490). Definitely. Pander looks really well developed now and I'll certainly think of putting it in any future additions. Are you living in Korea? Could be good to make a chance to meet. Yep 고감자, I'm in Korea this summer. It would be good to meet up. Just send me an email to the email address on my Bio page. I would love to read your book, but it isn't available in any way I can get it unless I have it shipped overseas. Have you thought about making it available to Safari Books, OReilly Media, or some other distributor with an epub format? Jillian, thanks for your interest in the book. Currently it's available in electronic form as an Amazon Kindle ebook. Not sure if your able to purchase those from the county you're in. The publisher is also planning to make it available in PDF format through their website. Though I'm not sure the exact date when that will be released. I'm thinking of reviewing your book for my blog http://politicalsciencereplication.wordpress.com. If you're interested, could you get in touch with me?